Triform Success Story: Aerospace Manufacturer Minimizes Sub-tier Supplier Issues and Maximizes Manufacturing Flexibility . A US based, industry leader in aircraft manufacture, aircraft modification, and aerostructures fabrication serving commercial, military, and original equipment manufacturers was searching for a 360-degree forming package to help optimize their operations. They needed to replace dated, underperforming equipment; and they wanted to add new equipment and technologies to their arsenal of ever expanding capabilities. The manufacturer also wanted to eliminate downtime of their critical path equipment and maximize efficiencies across their forming operations. Beckwood Press Company met with the manufacturer to help evaluate their current operations and to help shine a light on the parts of the operation that could benefit the most from new technological upgrades, replacements and additions. After extensive assessment, Beckwood and the client decided upon a 7 press forming package from the Triform, aerospace focused, family of forming equipment. 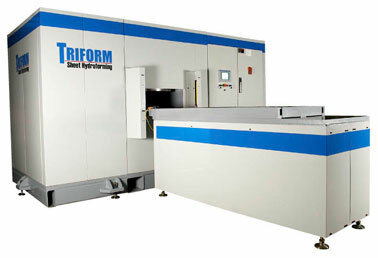 The comprehensive package, consisting of Triform sheet hydroforming presses, stretch forming machines and hot joggle presses, fully supported the customer’s mission of increasing its internal metal forming capabilities to minimize sub-tier supplier issues, while increasing overall flexibility and efficiencies. 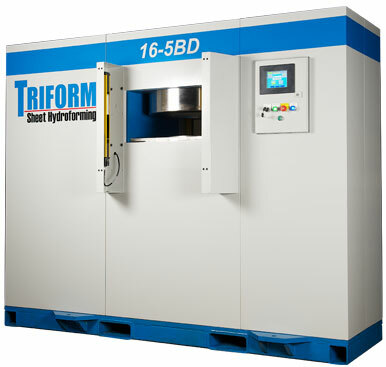 2 Triform Fluid Cell Sheet Hydroforming Presses, Model view video of this in action. 1 Triform Fluid Cell 2496-5BD with a bed shuttle for loading convenience and forming efficiency. 2 Triform 20 ton capacity Extrusion Stretch Presses each facilitating a maximum part length of 240", with a tool table dimension capacity of 36" x 48". These presses include integrated tooling heat, joggle rams and fully programmable controls. These machines are designed to stretch and contour even the toughest aerospace alloys into a variety of roll formed profiles. The stretch forming process can typically create net shape curves in a single step process which traditionally would require multiple hits with traditional press forming methods as well as hand finishing – considerably reducing production costs. 2 Triform 50 ton Joggle Presses with 20" x 36" work areas, tool holding fixture tables (engineered to accommodate the customer's existing tooling), and integrated heat and clamping capability. These joggle forming presses are designed to form parts which require multiple bends, often in opposite directions. As with the sheet hydroforming and stretch forming machines, these presses can form a net shaped part in a single step saving time, while helping to eliminate waste and reducing skilled labor. As is common with Beckwood Equipment, these presses included several supplementary items aimed at increasing efficiency, and eliminating unplanned downtime of the equipment. These include on-board Overall Equipment Effectiveness (OEE), complimentary remote factory support with Beckwood'sPressLink module, and Preventive Maintenance (PM) performed by factory-trained Beckwood personnel on the user's factory floor. This comprehensive forming package copiously supports the supplier's major in-house assembly programs directly, minimizing sub-tier supplier issues and maximizing the organization’s manufacturing flexibility. Since all of the machines incorporate the same technology frameworks, training and support is also simplified for the client. The client is expecting to be able to take on new projects they were not previously equipped to handle, and to turn around long standing jobs much quicker with better profit margins.